Posted on 06/08/2011 by Trần Phước Hùng	| Bạn nghĩ gì về bài viết này? 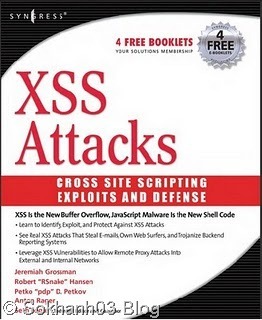 This book is all about XSS. It will cover these topics on XSS. Khai thác lỗi xss thế nào? ‘XSS’ also known as ‘CSS’ – Cross Site Scripting. It is a very common vulnerability found in Web Applications, ‘XSS’ allows the attacker to INSERT malicous code, There are many types of XSS attacks, I will mention 3 of the most used. This kind of vulnerability allows an "attacker" to inject some code into the applications affected in order to bypass access to the website or to apply "phishing" on falls users. This technique is also used for website Hacking. DOM-Based : The DOM-Based Cross-Site Scripting allow to an attacker to work not on a victim website but on a victim local machine: the various operative system usually includes "since born" some HTML pages created for differents aims, but as long as the humans do mistakes this HTML pages often can be exploited due to code vulnerabilities. – The attacker easily gain control on the victim computer. Non-Persistent : The non-persistent XSS are actually the most commons vulnerabilities that can be found on the Net. It’s commonly named as "non-persistent" because it works on an immediate HTTP response from the victim website: it show up when the webpage get the data provided by the attacker’s client to automatically generate a result page for the attackers himself. Standing on this the attacker could provide some malicious code and try to make the server execute it in order to obtain some result. is vulnerable, the result page will return the result of these HTML entities. Persistent : The persistent XSS vulnerabilities are similar to the second type (Non-persistent XSS), because both works on a victim site and tries to hack users informations and the difference is that in websites vulnerables to Persistent XSS the attacker doesn’t need to provide the crafted url to the users, because the website itself permits to users to insert fixed data into the system: this is the case for example of "guestbooks". Usually the users uses that kind of tool to leave messages to the owned of the website and at a first look it doesn’t seems something dangerous, but if an attacker discover that the system is vulnerable can insert some malicious code in his message and let ALL visitors to be victim of that. This works when the tool provided (the guestbook in the example) doesn’t do any check on the content of the inserted message: it just inserts the data provided from the user into the result page. To start finding these Vulnerabilities you can start checking out Blogs, Forums, Shoutboxes, Comment Boxes, Search Box’s, there are too many to mention. Using ‘Google Dorks’ to make the finding easyier, Ok if you wanna get cracking, goto google.com and type inurl:"search.php?q=" now that is a common page and has alot of results. Also note that most sites have XSS Vulnerabilities, its just having a good eye, and some good knowledge on how to bypass there filteration. now this will alert a popup message, saying "hackingandtips.blogspot.com" without quotes. if you see the bold text on the page and newlines then you knows its vulnerable. How to Deface a Website using XSS ? is a tag, that displays the IMAGE linked to it on the webpage. ok now if you change the link to a valid picture link, and save it and run it you will see what i mean. Right now say you have found a Shoutbox, Comment box, or anything that shows your data after you submitted it you could insert the following to make the picture display on the page. The other tags are not needed has the page will already have them. Ok it helps to make your picture big so it stands out and its clear the site got hacked. Another method is using FLASH videos, its the same has the method below but a more stylish deface. How to Cookie Stealing using XSS ? 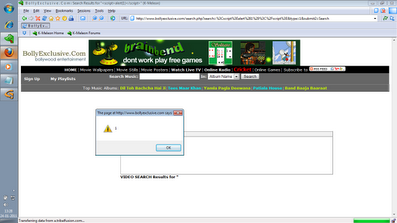 I decided to add this has its the most usefull method of XSS. First learn how to make cookie logger from here: How To Make A Cookie Stealer Php script ? and chmod it to 777, ok now find a XSS vulnerable website, any attack type will do ok now your gonna want to insert this code. How to Bypass Filtration ? that will do the same thing has <script>alert("XSS")</script> on a vulnerable server. You can also try hexing or base64 encoding your data before you submit, Please note its bad practice to use alert("XSS") to test for XSS, because some sites block the keyword "XSS" before so we using "hackingandtips.blogspot.com". is suitable for this kinda things, its easy to setup, im gona give it my args below. Ok now "String.fromCharCode(72, 79, 67)" Is a JAVA (ASCII) way of saying "HOC". And to use this with alerts etc, you dont need to use quotes, as it acts as a variable.